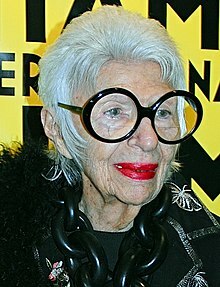 Iris Apfel (née Barrel; born August 29, 1921) is an American businesswoman, interior designer, and fashion icon. Born Iris Barrel in Astoria, Queens, New York, Apfel is the only child of Samuel Barrel, whose family owned a glass-and-mirror business, and his Russian-born wife, Sadye, who owned a fashion boutique. Both were Jewish. She studied art history at New York University and attended art school at the University of Wisconsin. As a young woman, Apfel worked for Women's Wear Daily and for interior designer Elinor Johnson. She also was an assistant to illustrator Robert Goodman. Through their business, the couple began traveling all over the world where she began buying pieces of non-Western, artisanal clothes. She wore these clothes to clients' high-society parties. In 2016, she performed in a television commercial for the French car DS 3, and was the face of Australian brand Blue Illusion. In March 2016, Apfel announced a collaboration with technology startup WiseWear on an upcoming line of Smart Jewelry. In 2018 she published a book entitled Iris Apfel: Accidental Icon. In 2019, at the age of 97, she signed a modeling contract with global agency IMG. On September 13, 2005, The Costume Institute at the Metropolitan Museum of Art in New York premiered an exhibition about Iris Apfel's style entitled Rara Avis (Rare Bird): The Irreverent Iris Apfel. It was the museum's first time showcasing an exhibit about clothing and accessories focused on a living person who wasn't a designer. The success of the exhibition, curated by Stéphane Houy-Towner, prompted an initial traveling version of the exhibit at the Norton Museum of Art in West Palm Beach, Florida, the Nassau County Museum of Art in Roslyn Harbor, New York, and later at the Peabody Essex Museum in Salem, Massachusetts. The Museum of Lifestyle & Fashion History in Boynton Beach, Florida, is designing a building that will house a dedicated gallery of Apfel's clothes, accessories, and furnishings. At age 90 in 2012, Apfel was a visiting professor at University of Texas at Austin. Apfel consults and lectures about style and other fashion topics. In 2013, she was listed as one of the fifty "Best-Dressed over 50" by The Guardian. Apfel is the star of a documentary by Albert Maysles, called Iris. It premiered at the New York Film Festival in October 2014, and was subsequently acquired by Magnolia Pictures for US theatrical distribution in 2015. Apfel was also featured in the documentary If You’re Not In the Obit, Eat Breakfast, a television film which premiered in 2017. In 2018, Mattel created a Barbie doll in Apfel's image, making her the oldest person to ever have a Barbie made in her image. Iris Apfel was awarded the Women Together Special Award of the Year at the 12th Annual Women Together Gala at the United Nations Headquarters in New York City, June 7, 2016. She was accompanied by other awardees, including Hollywood actress Rosario Dawson, the Punta Cana Foundation, the Loewe Foundation and others. Apfel was handed the award by Malu Edwards Hurley, member of the board of directors of Women Together and MC of the gala event, together with Carlos Jimenez, representative of Spain at the United Nations Headquarters in Brussels. In November of 2016, Apfel was awarded the Women's Entrepreneurship Day Pioneer Award for her work in the fashion field at the United Nations in New York City. Apfel's husband of 67 years, Carl Apfel, died on August 1, 2015. ^ a b Hodson, Heather (3 March 2007). "Anything goes". The Daily Telegraph. London. ^ "Iris Apfel: a Jewish Collector of Great Style". The Jewish Daily Forward. 20 November 2009. Retrieved 27 April 2016. ^ "Biography". businessoffashion.com. The Business of Fashion. Retrieved 28 October 2016. ^ Carl Apfel findagrave.com, retrieved July 22, 2017. ^ Hodson, Heather. "Anything goes". telegraph.co.uk. Retrieved 2015-10-02. ^ "Iris Apfel Does a Cool Car Commercial for the DS3 Facelift". Autoevolution. Retrieved 28 March 2016. ^ Jenni Ryall (24 February 2016). "94-year-old fashion icon Iris stars in campaign for Australian fashion brand". Mashable. Retrieved 27 April 2016. ^ "Wisewear". Wisewear. Retrieved 2017-06-26. ^ March 31, 2016 (2016-03-31). "An Inside Look: WISEWEAR x IRIS Launch Party". Blog.wisewear.com. Retrieved 2017-06-26. ^ a b c CNN, Emily Dixon (2019-02-06). "Iris Apfel signs contract with IMG". CNN Style. Retrieved 2019-02-07. ^ "Rara Avis: Selections from the Iris Barrel Apfel Collection". metmuseum.org (Press release). Retrieved 27 April 2016. ^ "Norton Museum of Art Event Info". museumsusa.org. Retrieved 27 April 2016. ^ "PEM - Rare Bird of Fashion: The Irreverent Iris Apfel « Exhibits". Archived from the original on 2009-10-16. ^ Staff Writer (5 January 2012). "Rare Bird of Fashion—and Academia". utexas.edu. Retrieved 27 April 2016. ^ "Iris Apfel is the Goddess of style". Toronto Star, November 11, 2016, Leanne Delap. ^ Warburton, Sophie (26 August 2011). "Victoria's Secret News". The Daily Telegraph. London. ^ "First look: Iris Apfel film". elleuk.com. Retrieved 27 April 2016. ^ "Un documentaire sur Iris Apfel". Vogue (in French). Retrieved 27 April 2016. ^ "Magnolia Pictures Acquires 'Iris,' Albert Maysles' NYFF Documentary". 24 October 2014. ^ Gonzales, Erica (2018-03-28). "Iris Apfel Just Became the Oldest Person to Have a Barbie Made After Her". Harper's BAZAAR. Retrieved 2019-02-07. ^ Wendy Diamond. "Women's Entrepreneurship Day Organization Pioneer Awards 2016 Winners". WED. Retrieved July 5, 2018.